Members of “M” Division under Supt. J.D. 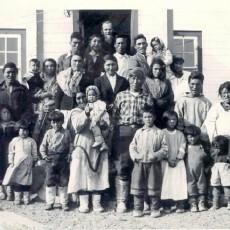 Moodie at Cape Fullerton in 1904, are, back row, from left, Consts. Verity, Seller, and Heaps, Sgt. Nicholson, Consts. Stothert and Jarvis; centre from left, are Sgt. Donaldson, Consts. Russell and MacMillan and Special Const. Moodie; front, from left, are interpreter Lane, Staff Sgt. Hayne, Supt. Moodie, Insp. Pelletier, Sgt. Major Dee, interpreter Ford and Mike the husky; in foreground is Sgt. McArthur. The RCMP detachment in Chesterfield Inlet recently conducted a short-term research on family members of – Staff. Sgt. M.H.E. Hayne (Reg. #869) – dated back to April 18, 1906 – and Const. J. Russell (Reg. 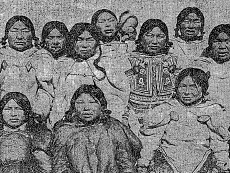 # 4152) – Aug. 5, 1905 who were posted at Cape Fullerton in Inuktitut Qatiktalik to identify their next of kin family members of two former Royal North West Mounted Police officers that worked and posted at Fullerton Harbour in early 1903 to 1905. In an attempt to establish sovereignty in the Northwest Territories, the federal government decided to send the North West Mounted Police into the Arctic along the Hudson Bay coast to provide year round presence. On Sept. 3, 1903, under the direction of Supt. J.D. Moodie, the first North West Mounted Police outpost was established at Cape Fullerton, approximately 60 km northeast of Chesterfield Inlet. While sovereignty was the primary reason for the establishment of the outpost, the four police officers were responsible for the administration of the whaling licenses, collecting customs, controlling the flow of liquor and to maintain order in the north during the whaling era. Const. Luc Deslisle, who worked in Chesterfield Inlet this summer until September, 2012, approached the local economic development office to see if there was any information of the two former officers, Hayne and Russell, who were posted at Cape Fullerton in early 1900’s or if there were any information of their family members who may possibly able to be located. This research was started and coordinated by Delisle through on-line searched of censuses and possible ancestry information, and by contacting various museums in Canada in an effort to locate the officers’ families. This project has resulted in unique short-term research with the local RCMP detachment in Chesterfield Inlet on Fullerton outpost history, much of which is just partial information as much of the history is unfortunately not preserved or not documented in records or not known at all. This next-of-kin research of two Hayne and Russell was initiated to try and locate their families due in part poor documentation which was either never preserved or never in the records. However, some information or reports were identified of the two former officers that were posted and reported during operations in Cape Fullerton from 1905 to 1906. Each year RCMP in Chesterfield Inlet regularly visit the sites during summer to preserve burial sites, and unfortunately structural buildings at Fullerton Harbour have become corroded due to no preservation efforts, though they are an important part of history in the Kivalliq region and that of the distinct Inuit tribes in the region (the Aivilingmiut, Qainirmiut, and the Natilingmiut). Cape Fullerton was also once known for anchorage and outpost for the Euro-American whaling vessels during the whaling era.